If you’re shopping for a wet location LED light bulb for outside your home or office, we have a great option to share with you! 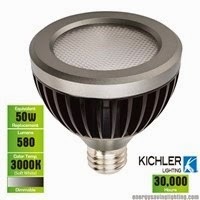 The Kichler PAR30 LED landscape lamp offers light comparable to a 50 watt halogen, while saving on your energy bills. In fact, this 13 watt bulb can give you a yearly savings of $47 and a lifetime savings of $133! Putting forth a 25 degree wide spot beam, this 3000k pure white LED lamp is perfect for illuminating your landscape for safety at night or to showcase a specific part of your landscaping. It’s designed for use in both enclosed fixtures and open ones, so there’s no need to worry about whether you have the appropriate fixture for this lamp. Additionally, the weather coating and epoxy potted electronics appropriately match the end-user application to assure great durability during all types of weather. With a cast aluminum heat sink, this bulb offers increased thermal management, ensuring that your electricity goes to lighting, not heating. One of our favorite parts of this light bulb is how long it lasts: 30,000 hours in an enclosed fixture. That means that if this bulb is working an average of 8 hours a day, it will still be going strong a decade after you first installed it! Custom optics allow this bulb to deliver a uniform beam from the center to the edge, giving you consistent lighting throughout the bulb’s spread. We’ve been loving all of the cool ways people have been using rope lighting to decorate their homes! One of our new favorites this holiday season is festive word art using rope lighting, and it’s a DIY party decoration that couldn’t be easier to make! If you have a helper, making rope lighting art is a snap. Just choose the color of LED rope lighting you want — red or green would be especially festive for a holiday party, but cool white lights would be nice as well. Hold on to the rope cap and mounting hooks that come with the rope lights — you’ll need them! Once you’ve sketched out the word, start adding the rope light to the wall, keeping in mind where you’ll plug in the rope light. Your helper can hold the first letter in place and you can step back to see if any adjustments need to be made. When you’ve gotten the letter perfect, use your painter’s tape to hold the letters in place and give you time to attach the mounting hooks with your drill. If you run into any awkward spots where you’ll need more than one mounting hook, the Velcro clips will come in handy! Continue on with each letter until you’ve completed the word. Do you plan to try this holiday party decoration in your home this year? Let us know in the comments! We’d love to hear about your DIY decorating projects!